When I first started my experience at Jaseng, I was excited and open-minded about learning Korean medicine, but I was also somewhat skeptical. Perhaps because of where I was raised, I had little to no exposure to traditional oriental medicine of any kind, except what was commonly portrayed in American media. Though some people swore by traditional medicine, it was more frequently portrayed as ineffective. However, during my time at Jaseng, I lost almost all of my initial skepticism and came to really believe in what Jaseng does. For instance, a large initial concern for me was the lack of research that met international standards on the effectiveness of traditional treatments. Although this problem is not yet totally remedied, I was able to see firsthand that Jaseng is making a concentrated effort to produce credible research, even partnering with institutions like Rush. Part of what I wondered about was the role of the placebo effect played in Korean medicine. Due to the sum of my experiences at Jaseng, I no longer wonder if all of the effects can be attributed to the placebo effect. First, I was given the opportunity to watch the treatment of many cases, including some emergency or extreme cases. The improvement of the patients was so drastic that it cannot be solely attributed to the placebo effect. People who were completely unable to walk beforehand, cannot start walking again without intervention. Secondly, upon meeting Dr. Shin, he talked passionately about wanting to encourage patient’s self-healing power. While this may seem initially odd to a Western audience, it is just the words that are unfamiliar. Even in Western medicine, everyone widely acknowledges that the attitude and belief of the patient plays a large role in the success of their recovery, and it is not any different with Korean medicine. Another misconception that I previously had about traditional Korean medicine was that all practitioners of Korean medicine were opposed to any use of Western medicine. However, the thing that impressed me most about Jaseng was the priority placed on the patient. In order to give the patient the best care, Jaseng utilizes both Eastern and Western medicine, and if necessary, will send patients to get surgery. Using the two together allows them to complement the strengths of both, and make-up for the separate weaknesses that both approaches have. For instance, surgery is often the first solution in Western medicine, even though it can be difficult and damaging. Jaseng instead approaches surgery as a last resort, and usually successfully treats patients without the need for invasive surgery. However, as I personally witnessed, in extreme cases where appropriate, Jaseng also did not hesitate to advise patients that surgery was their best option. In line with all of this was that while Jaseng produces truly impressive results, doctors were also honest with patients about the level of improvement they could expect to see. In my personal opinion, the blending of the two approaches in order to place the emphasis on the good of the patient is Jaseng’s greatest strength, and one that they do very well. Moving away from general perspectives on Jaseng, I would whole-heartedly recommend Jaseng to other students pursuing a career in medicine. My experience was extremely positive, and beneficial, and I am indebted to the Jaseng staff. To start with, my Korean ability is not sufficient for learning about Korean medicine without help, but to the constant help and translation of several capable staff members, I never felt hindered by my lack of ability. Instead, the staff went above and beyond to ensure my understanding. The entire time I was at Jaseng, I was treated as if I was a guest of honor, despite the fact that I am sure I greatly inconvenienced them at times. In particular, Yesul put together a really wonderful program. I really appreciated the time she spent patiently teaching me about Korean medicine the first week. Because I didn’t know anything about Korean medicine beforehand, I had many questions, but she patiently answered them all and made sure that I understood before moving on. I think this was extremely helpful, and provided a good foundation for the rest of what I would do and see at Jaseng, and it would have been very difficult had Yesul not already explained the basics to me. I also appreciated the different shadowing opportunities I was allowed to have. Although I wish I had been able to shadow Dr. Royer more, it was not Jaseng’s fault that there were very few English speaking patients during my time there. So, this isn’t to be taken as a critique of the program in anyway, just an earnest wish that I could have been able to observe even more. A few other particular days were really great, and meaningful to my experience. First, being treated myself was very eye-opening. While being able to watch patients improve first-hand is very helpful, being treated yourself truly shows how much of an effect traditional treatments like acupuncture, and newly-developed treatments by Jaseng can have an effect. That being said, the highlight of my time at Jaseng was probably the trip to Daejeon. In Daejeon, I had the opportunity to witness several volunteers be treated at a lecture, as well as drastic cases at the Daejeon facilities. It was at Daejeon that I was able to see for myself how quickly Jaseng doctors were able to help patients who couldn’t walk get back on their feet, and I couldn’t have been more impressed. Again, it is one thing to watch videos of this, but it is different to see firsthand for yourself. In particular, I was also grateful to see Dr. Shin treat a patient who suffered from a “frozen face.” It was very different from the rest of the treatments I had been watching that day, and I found the results almost shockingly effective. While medicine struggles to treat musculoskeletal disorders, there are some things that can be done to help. But as far as I’m aware, very little can be done to help those with “frozen faces,” but there was already drastic improvement in such a short session with Dr. Shin. Furthermore, I think these types of cases are particularly excellent to show students from the West, because they can’t be faked in any way, therefore making it hard for them to maintain skepticism. Lastly, the trip to the herbal medicine facility was also very beneficial to me. Perhaps because of the stereotypes and misconceptions I talked about earlier, herbal medicine is generally viewed with a lot of suspicion in the West. Part of this might be due in part to a distrust of the herbs themselves, but Jaseng is quickly putting out research that proves the effectiveness of several of their medications. The second reason people will sometimes doubt is because there have been instances when the medicine was not properly prepared, sometimes causing unfortunate consequences. However, while I never really doubted that Jaseng’s medicine was being prepared carefully and safely, it was beneficial to see it first hand, especially because I was not familiar in anyway with the preparation of herbal medicine. In particular, I think a strength of Jaseng’s medicine is the ability to tailor the medication to each patient. This not only makes the medicine more effective, but makes situations where patients may have allergies much easier to solve. As a whole, I now have a very positive view of Jaseng Hospital and its use of Korean medicine. I’m still not sure how I feel about other Korean medicine hospitals, because to my knowledge, Jaseng is very unique. But within the context of how Jaseng uses Korean medicine, I now have a very favorable and positive opinion. I don’t have many critiques of how things were run that I saw when I was there, besides the few things I mentioned already in the “In-patient Facility Report.” Besides shadowing more (which was out of Jaseng’s control a bit), I would also have liked to see the car-accident treatment facility, but time was unfortunately limited. There wasn’t anything within Jaseng’s control that I can think of that I would have changed. From my perspective, Jaseng and Korean medicine is focused on utilizing as much of a patient’s inherent healing ability via the most non-invasive methods possible. An emphasis is placed on reducing the patient’s pain, and/or improving their mobility, and on slowly escalating treatment options, with surgery as a last resort. My experience at Jaseng has led to the personal conclusion that Jaseng’s treatments are very effective and promising, and that many people could benefit from them, and the more holistic approach to musculoskeletal disorders in particular. 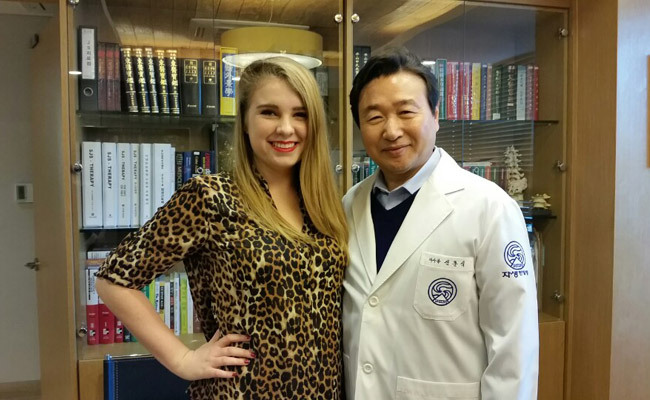 Again, I would highly recommend my experience to other students looking to expand their knowledge of medicine, particularly if they are interested in osteopathic medicine, or traditional Korean medicine.